The automotive lighting market is driven by the development of lighting solutions by various manufacturers such as adaptive front and rear lighting and dynamic bend lighting systems. Increasing demand from OEMs for advanced LEDs and laser-based light modules to improve the vehicle safety parameters and providing aesthetic looks to the vehicles further contribute to the industry demand. The popularity of the intelligent lighting technologies in the commercial vehicles, such as situation-based light control and driver assistance at night, creates several growth opportunities in the automotive lighting market. Factors such as rising purchasing power and improving consumer lifestyle across various regions are contributing to the increasing sales of luxury vehicles and passenger cars. Increased automotive production and a high demand for passenger vehicles create growth opportunities for the automotive lighting market. With the growing demand for automobiles across the globe, the utilisation of automotive lighting products has increased rapidly. The global automotive industry identifies the need for intelligent and green lighting solutions. Additionally, government programs and initiatives to reduce the number of road accidents and improve the driving experience are anticipated to provide an impetus to the automotive lighting market. For instance, the National Road Safety Policy in India has initiated several measures including raising road safety awareness, launching an information database. LED lighting technologies are witnessing a high popularity in the automotive industry due to the rising implementation of vehicle lighting systems. LEDs offer several benefits such as performance and energy efficiency, bright lights and low power consumption. Major users of the LED-based automotive lighting market products are global automotive OEMs including Audi, BMW, Honda Motor Company, General Motors, Tata Motors. However, high tariff and trade restrictions in several countries will hamper the automotive lighting market growth. These restrictions limit the sales of lighting and other automotive systems to different countries. In addition, fluctuations in the raw materials and component prices due to changing supplier conditions will hinder the product development. In the automotive lighting market, the passenger cars segment is anticipated to grow at six percent CAGR from 2018 to 2024. A high demand for passenger cars across the globe is compelling the increasing consumption of lighting products. An increased focus on enhancing the vehicle aesthetics and looks by automobile companies demands advanced and high-quality lighting systems. The commercial vehicles in the market are witnessing steady growth due to the implementation of enhanced lighting products. These vehicles require highly efficient lighting components to offer a longer life and quick response in emergency situations. The demand for commercial vehicles is on the rise due to the growth in trade and transportation business and government infrastructure development projects. The interior automotive lighting market is expected to grow at seven percent CAGR from 2018 to 2024. Modern passenger cars and luxury vehicles deploy advanced LED and halogen lamp components in the interior systems. These components lend enhanced ambiance and atmosphere to the modern cars. The implementation of LEDs in vehicle interiors supports the smart and intelligent technologies such as automated light switching, touch-free lighting, and colour consistency. These systems provide illumination and brightness benefits while driving at night and support the situation-based light controlling in modern vehicles. 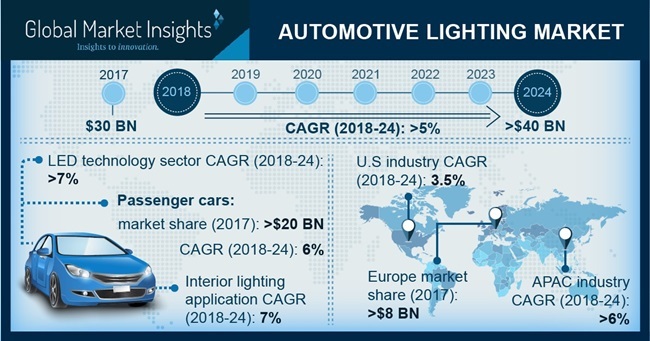 The European automotive lighting market was valued at over $8bn in 2017 and is anticipated to grow further due to the presence of major automotive manufacturers in the region such as BMW, Audi, Mercedes-Benz, etc. Additionally, several manufacturing standards set by the European Commission to support sustainable development and energy-efficient products account for the industry growth. Lighting system manufacturing companies across the globe follow these standards for manufacturing the lighting components used in automobiles. The automotive lighting industry is fragmented with the presence of a large number of enterprises and small players. The established companies in the industry possess a significant purchasing power and have strong partnerships and collaborations with the suppliers and OEMs. Companies operating in the lighting marketplace focus on the research and development activities to offer highly efficient and technically advanced products, expanding the regional presence to gain eminence in the market.